I’m also publishing this for my own records and folks asking me about it, as it is not a super straight forward procedure.. 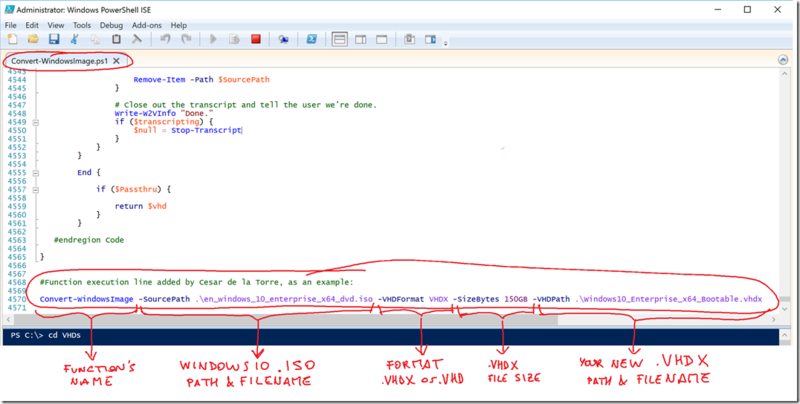 This procedure is very useful when you need to boot Windows natively, but you need to have multiple different environments like when using BETA/RC versions of Visual Studio, dev tools or simply dual/multiple boots with different configuration and software installed but you don’t want to have any compromise in UI performance like when you use Hyper-V or any other virtual machine environment. Doing this you don’t have to give up on performance, this is the real thing! you boot natively. This is NOT a VM (Virtual Machine) booting from Hyper-V. 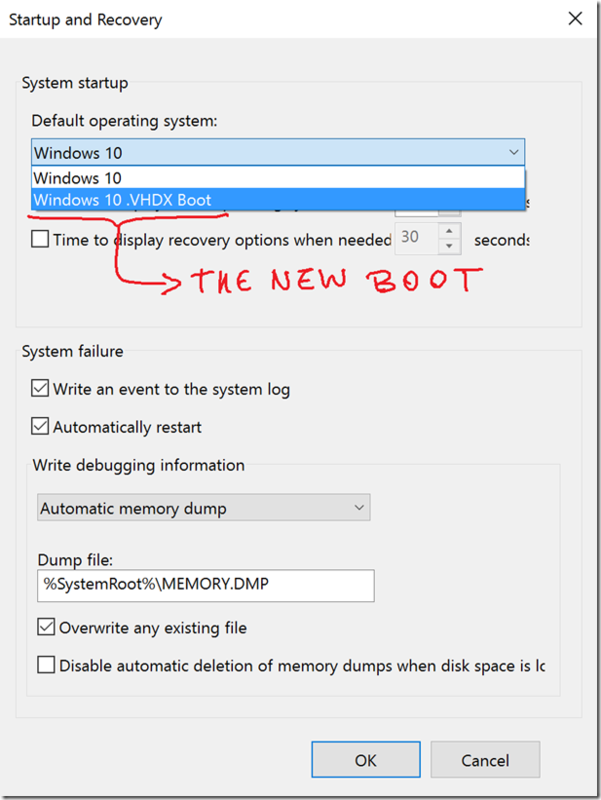 This is native boot but instead of booting from files in a partition, you boot from files that are placed within a .VHDX file. But you boot natively! 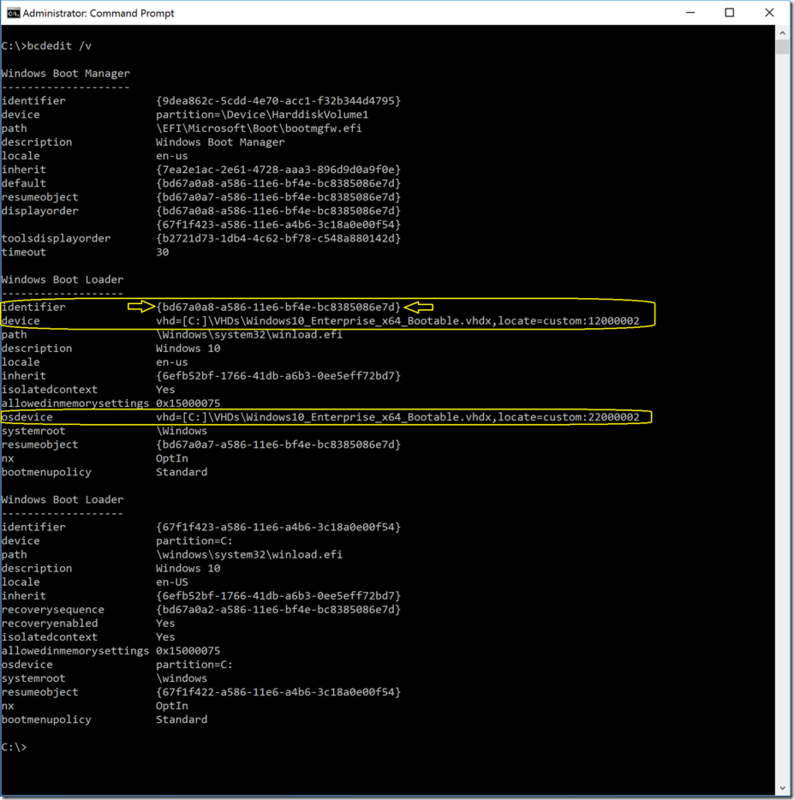 – Need to use Android emulators on top of any hypervisor like Hyper-V (Nested virtualization doesn’t have great performance..). – If you want to deploy mobile apps from Visual Studio (Xamarin apps to Android or Windows devices, for instance), you’d need to connect those mobile devices to any USB port. But, Hyper-V VMs don’t support USB connections to devices. – In any case where you want to get good performance from your machine because what you get from a Hyper-V VM is not enough and at the same time you want to handle multiple environments within the same machine (although you’d be able to boot just one of them, of course). This is the way I currently do it. I’m using .VHDX format but you could also specify a .VHD (older) if you’d like. Here are the steps. Pretty simple, actually! 1. You need to have any Windows .ISO image, like a “Windows 10 x64 – DVD (English)” from MSDN subscription, or any other version (any Windows 10 version and x64 or x86). 5. Edit the Convert-WindowsImage.ps1 file with Windows Powershel ISE (or with any editor, even NOTEPAD can work for this). 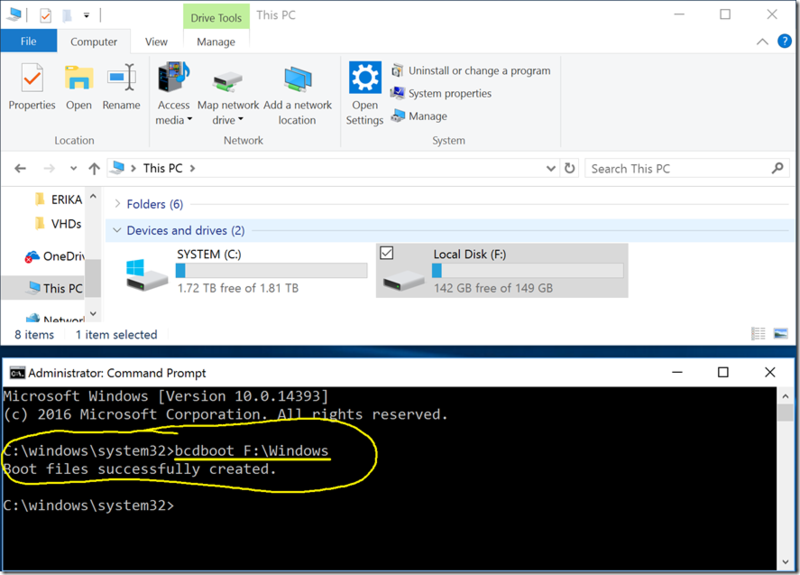 If using Windows Powershel ISE, you’d better run it with admin rights (“Run as Administrator” mode) so you can directly run the script with F5 afterwards. 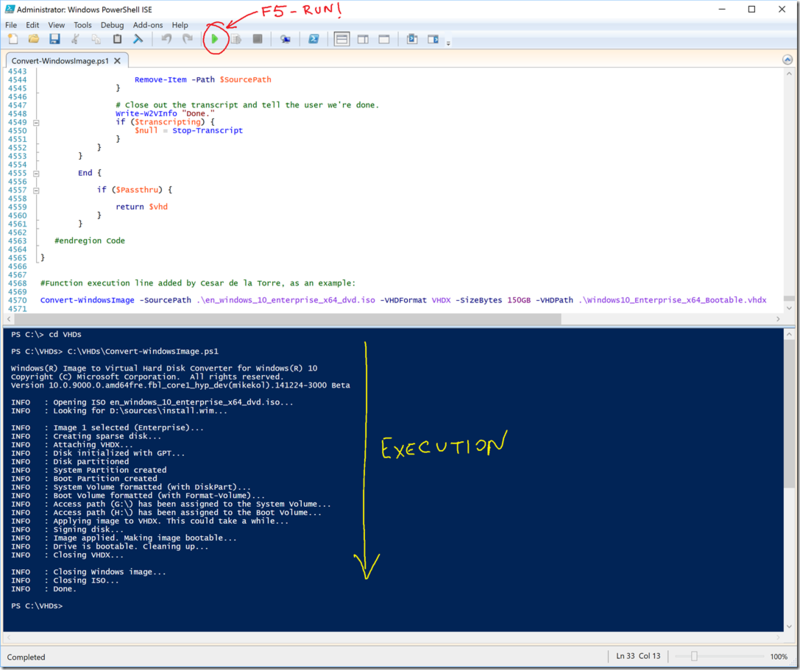 It’ll be executed like the following screenshot. Be patient, it’ll take a while as it has to copy all the files from the Windows .ISO image to the logical drive based on the .VHDX file that has been created. Right-click the VHDX and mount it. In my case I got the F: as my mounted drive. b.Type bcdboot F:\Windows in order to create the boot files in your .VHDX drive. 9. SAVE/COPY YOUR “MASTER .VHDX IMAGE FILE”!!! Type again bcdedit /v, search for the boot loader pointing to the .VHDX and copy its GUID. 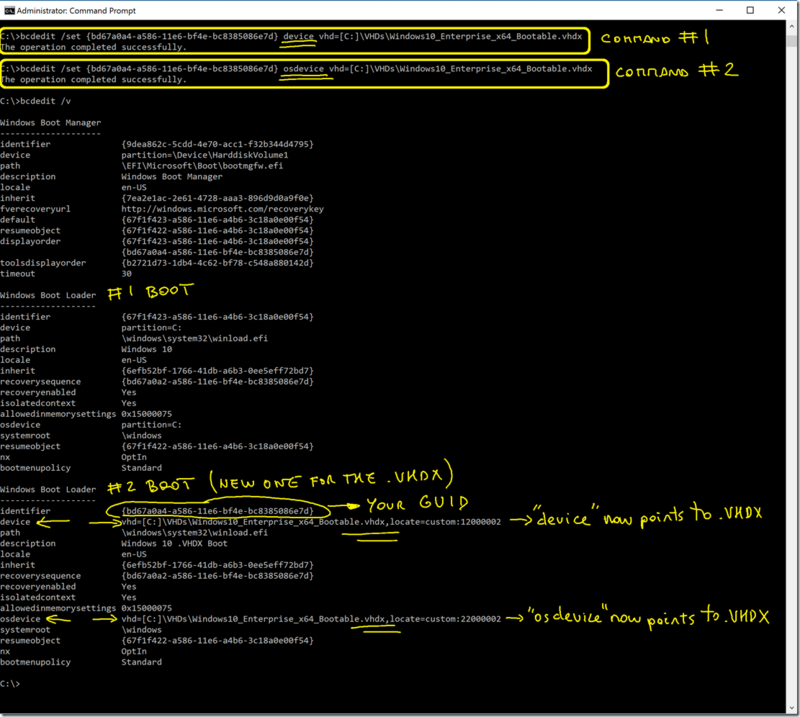 When messing with the startup, it rebuilds your boot configuration data store. But it doesn’t know if Hyper-V needs to have some specific settings enabled in the boot configuration data store in order to start the hypervisor. In any case, this is not related and you just need to do it if you also have HyperV installed. 12. YOU CAN NOW RE-START YOUR COMPUTER AND FINISH THE WINDOWS INSTALLATION. 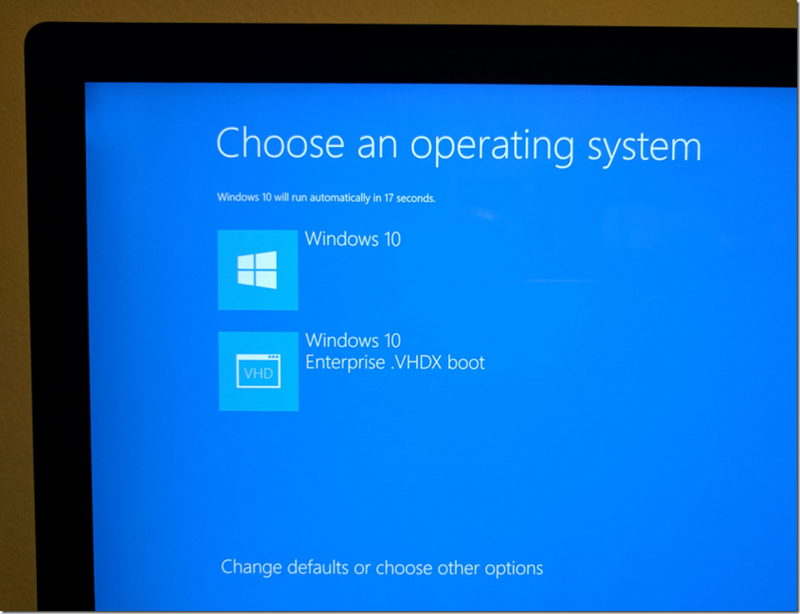 If you reboot your machine, you’ll be able to select the new NATIVE WINDOWS BOOT but from a .VHDX like in the following screenshot! It’ll be just the final Windows installation detecting devices, applying drivers and final configuration/personalization, and YOU ARE GOOD TO GO! If you copy the “MASTER .VHDX”, you could re-use it for multiple boots, even for other machines. 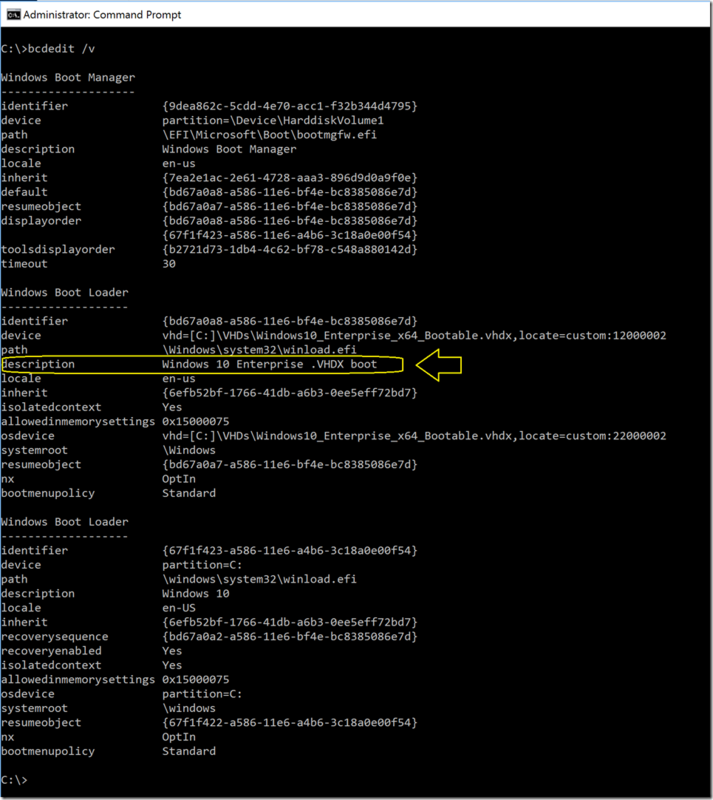 Here’s the procedure once you have an existing MASTER .VHDX already created. 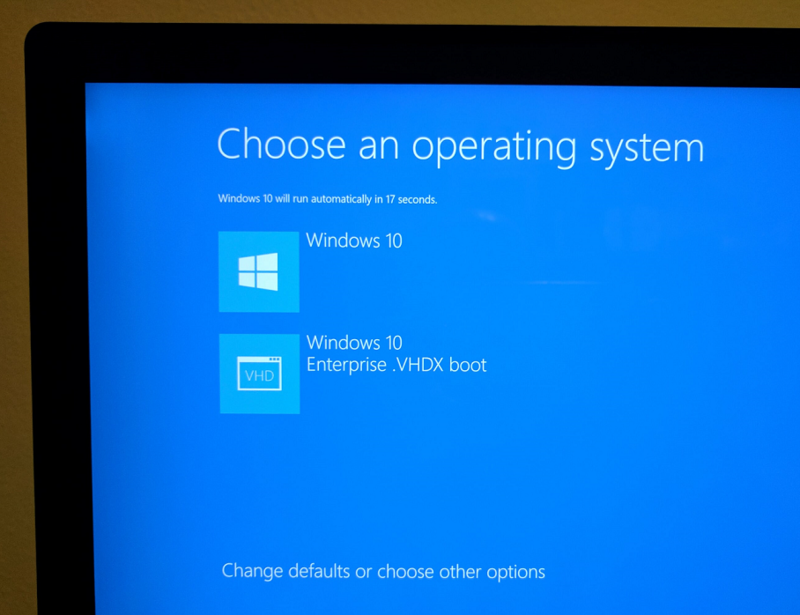 First, copy and rename the .VHDX to a different name depending on what you will install, like “Windows_10_for_Testing_Betas.VHDX” or whatever. In my screenshots I’m still using a similar name than before, though. 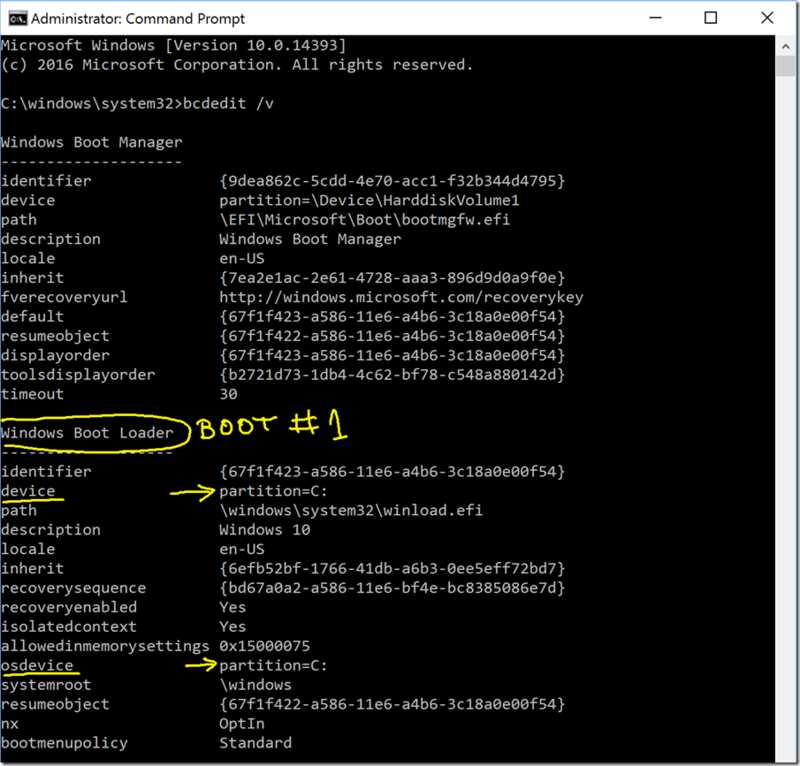 You can configure the boot options of windows by using the command-line tool bcdedit.exe. You can see that I currently just have a single boot loader, booting from the C: partition. That line means you are copying the current Boot loader (the one I marked) but naming it with a different DESCRIPTION. And also, very important, when you copy any BOOT LOADER, the new copy will have a new GUID identifier, which is what you are going to use. You can see how now you have a second BOOT LOADER (#2 BOOT) with a different GUID than the original (#1 BOOT). It also has the new description applied like “Windows 10 .VHDX Boot”. You’ll see that description when selecting the Boot option when starting your machine. However ,you are still not done, as that second BOOT LOADER is still pointing to the C:\ partition, and you want it to be pointing to the .VHDX file! Note the difference in “device” and “osdevice”..
Now, you are done with the “hard” configuration. 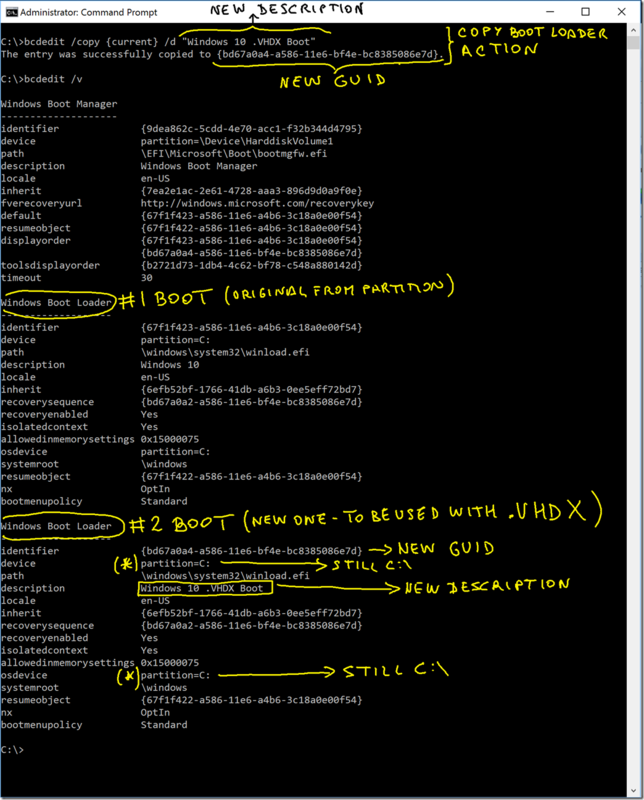 You can just reboot the machine and select the BOOT option for your new .VHDX, and it’ll boot natively from that .VHDX!